Title: Snow in the Tehachapis! 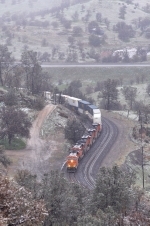 Description: Q-RICALT6-13A, a guaranteed-arrival BNSF Richmond, CA to Alliance, TX stack train, snakes up as snow begins to stick. Description: A trio of GEVO's leads a long intermodal train (with two more GEVO's pushing on the rear) down the Transcon into the tiny town of La Plata, MO. 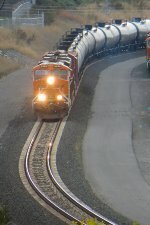 Title: BNSF 6903 Brings up a EB stack train! Description: EB stacks pass bye the town of Wyaconda Mo. Title: BNSF 6903 splits the signals on the transcon. Description: WB dpu's working in Dynamic. Description: An orange GE pair guides another oil train across the High Line at 0911. Description: 30th Street at 0911. Description: Also showing progress of third track recently started. Description: Third track progressing along! Description: Sunntmead Rd. CSX Trenton Line.